A new first was achieved today (May 26) when astronauts on the International Space Station opened the door to their newest spacecraft visitor, the private capsule Dragon. Dragon, built by commercial company SpaceX, arrived at the space station on Friday (May 25) and was attached to the outpost's Harmony node at 12:02 p.m. EDT (1602 GMT). It is the first private vehicle ever to visit the $100 billion space station, which is a partnership between five international space agencies. This morning, after checking the seal between the station and spacecraft for leaks, NASA astronaut Don Pettit opened the hatch leading into the Dragon at 5:53 a.m. EDT (0953 GMT) as the two spacecraft orbited 253 miles (407 kilometers) above the Earth, just west of Auckland, New Zealand. Pettit and Russian cosmonaut and station commander Oleg Kononenko were the first to enter the Dragon, wearing protective goggles and breathing masks as they tested to make sure the atmosphere inside the capsule was safe. The unmanned capsule is loaded with food, supplies and science experiments that the astronauts will spend about four days unpacking. 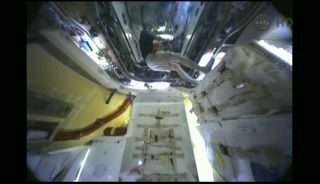 Dragon is on a test flight to prove its ability to serve as a cargo freighter for the International Space Station. SpaceX has a $1.6 billion contract with NASA to fly 12 supply delivery missions to the complex once Dragon has completed testing. If the current mission continues as successfully as it has been so far, these flights could begin in the fall. SpaceX is one of a handful of private companies attempting to fill the shoes of the retired space shuttles by delivering cargo, and eventually crew, to the International Space Station. The company (officially Space Exploration Technologies Corp.), based in Hawthorne, Calif., was founded in 2002 by entrepreneur Elon Musk, who also co-founded PayPal, the internet money-transfer service. Dragon launched Tuesday (May 22) atop a SpaceX Falcon 9 rocket from Cape Canaveral, Fla. The capsule spent a day catching up to the space station in orbit, and then made its first flyby of the outpost Thursday. On Friday, astronaut Don Pettit, using the station's 58-foot (18-meter) robotic arm Canadarm2, reached out and plucked the free-floating Dragon when it had approached to 33 feet (10 meters). He then maneuvered the capsule to the station's Earth-facing Harmony node, where he attached it using Dragon's common berthing mechanism. "You made history today and have firmly locked into place the future direction of America's space program," NASA Administrator Charles Bolden told the crew during a call to the space station on Friday. The crew’s berthing activities represented a long day for Pettit and the other astronauts working to dock Dragon, so they left the newly attached spacecraft unopened Friday, much like a wrapped Christmas present sitting tantalizingly under a tree. That cargo includes 674 pounds (306 kg) of food, clothing and pantry items Dragon has delivered, as well as the 46 pounds (21 kg) worth of student-designed science experiments and miscellaneous other supplies it carries. It should take about 25 hours to completely unpack the Dragon capsule and then fill it with other items due to return to Earth. Dragon is due to spend less than a week docked to the station before being filled with cargo for the return trip and sent back to Earth. The capsule's heat shield is designed to protect it from the heat of re-entry so it can safely splash down in the Pacific Ocean to be recovered. SPACE.com contributor Robert Pearlman, editor of collectSPACE.com, contributed to this story. You can follow SPACE.com assistant managing editor Clara Moskowitz on Twitter @ClaraMoskowitz. Follow SPACE.com for the latest in space science and exploration news on Twitter @Spacedotcom and on Facebook.